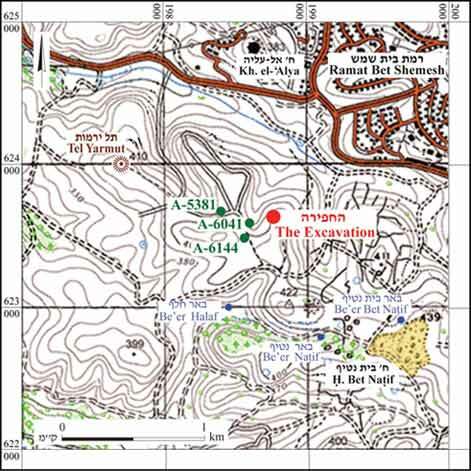 During July–August 2011, a salvage excavation was conducted in Ramat Bet Shemesh (Permit No. A-6228; map ref. 198734–43/623726–37), prior to construction. 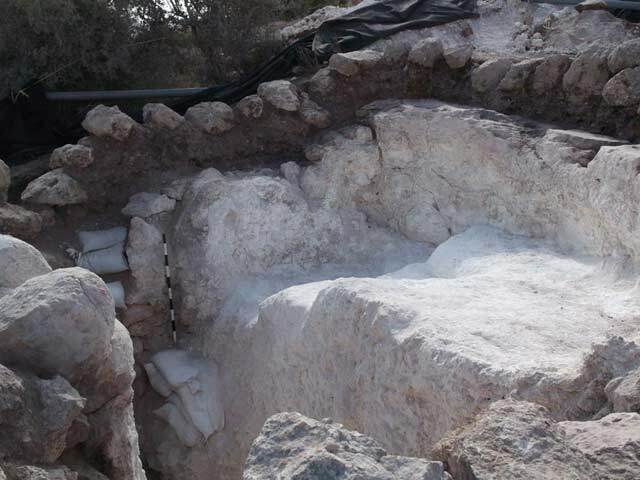 The excavation, undertaken on behalf of the Israel Antiquities Authority and underwritten by the Ministry of Construction and Housing, was directed by D. Storchan, with the assistance of N. Malka (administration), A. Hajian (surveying), E. Belashov (drafting) and R. Greenwald (inspection). 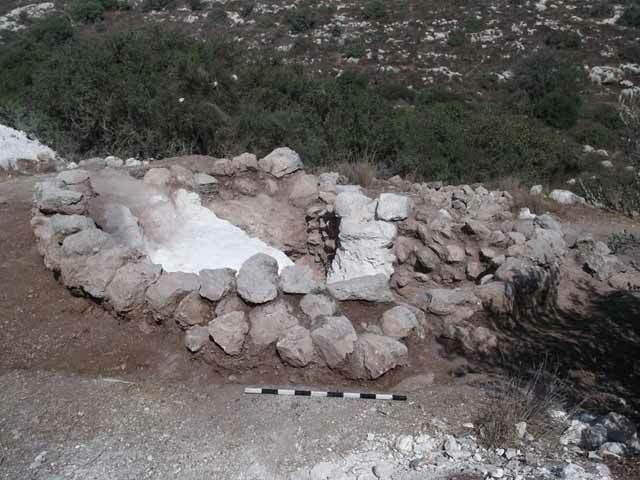 The excavation was located on the northern slope of a small hill, to the south of Ramat Bet Shemesh and to the northeast of Horbat Bet Natif (Fig. 1). An oval limekiln was uncovered. 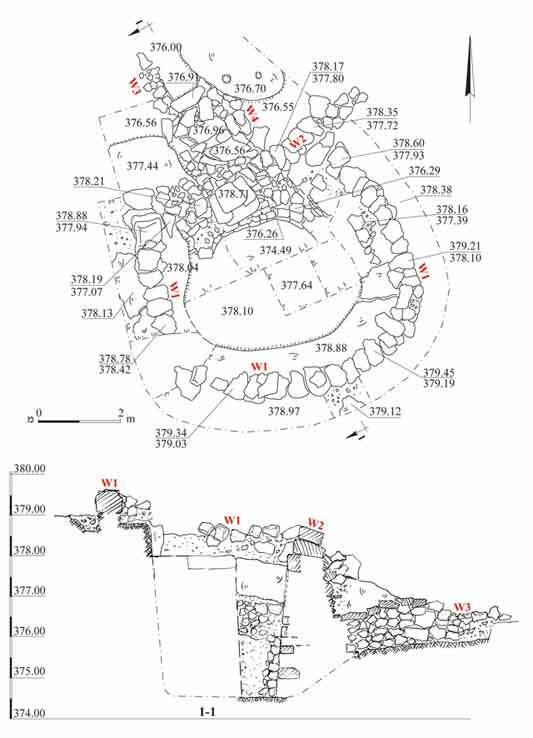 Past excavations in the immediate area uncovered the remains of three additional limekilns (HA-ESI 124, HA-ESI 124; Permit no. A-5381). All the kilns seem remarkably similar and have an ovular or circular plan with a partially stone built and hewn central firing chamber. It was noted prior to the excavation that the limekiln had been well preserved and a large mound of lime towered above the kiln’s outer support walls. The excavation exposed the kiln’s central firing chamber, built conduit, and the surrounding support walls (Fig. 2). The location of the oval central firing chamber (4.5×5.5 m, max. depth 5 m) seems to have been chosen based on a large natural dip in the bedrock. The dip was probably manually shaped and enlarged, although no clear signs of carving were discerned. The bedrock ridge formed by the depression served as the base for the central chamber’s southern and western limits (Fig. 3). As no bedrock was present on the eastern border of the firing chamber, the gap was intentionally filled with medium-sized fieldstones. Similarly, another wall (W2) was built in the north, spanning the width of the kiln. At the top of W2 in the central area, four large flat topped stones were arranged to create a rectangular window. Only the northwestern half of the chamber was completely excavated and within it, a homogonous layer of white lime was revealed. Below this layer and above the chamber's bedrock base, a layer of lime with black ashy inclusions was uncovered. Surrounding the outer periphery of the kiln, a circular wall was exposed (W1). The wall, built of large fieldstones and preserved to a maximum of two courses high, was set upon a layer of alluvial soil above the bedrock. Wall 1 seems to have been used as a support wall for the kiln’s domed superstructure (Fig. 4). The conduit, located to the north of the central chamber, consists of two parallel walls (W3, W4) that formed a narrow passageway (Fig. 5). The southern section of the passage, leading to the firing chamber (W2), was covered with four large rectangular slabs. At the connection of the passageway to the firing chamber, directly under the top ventilation window within W2, the bedrock dips down leading to three additional rectangular ventilation windows (Fig. 6). These windows, along with the additional window, built higher up at the top of the wall, would have allowed air to circulate within the chamber during the limekiln’s operation. Of all the limekilns recently excavated in the area, the current limekiln was found to have had the best state of preservation. The kilns, similar to each other, include a central ovular firing chamber. The chambers are mostly hewn in the bedrock, often making use of natural depressions or fissures in the bedrock. In areas where no bedrock was available, simple walls were added to frame the chamber. Although the upper superstructure of the limekilns was not preserved, an upper ventilation window was uncovered in the current kiln, unlike the other kilns. This large window, set at the top of the kiln’s firing chamber, may have been used as a loading niche and as an additional outlet for air circulation. A handful of potsherds were collected from the surface area surrounding the limekiln. The ceramic assemblage, dominated by gray Gaza ware potsherds from the Ottoman period, included a few badly worn potsherds from the Byzantine period. 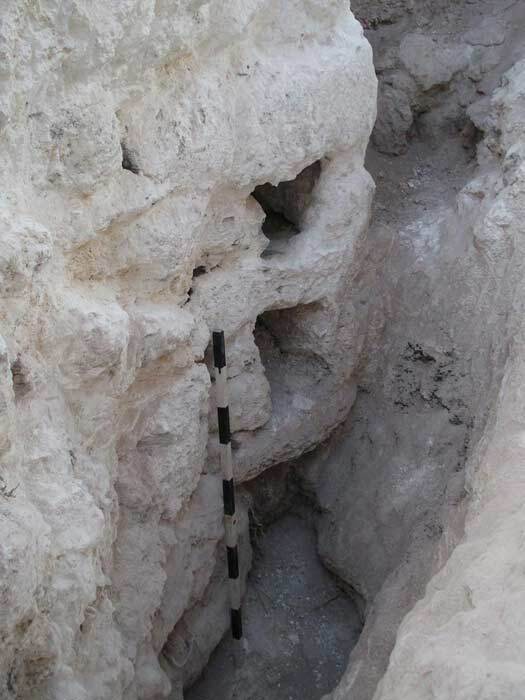 No indicative dateable remains were recovered from sound stratigraphic contexts and dating the kiln to the Ottoman period may be inferred from the kiln’s location in relation to H. Bet Natif and its resemblance to the other limekilns excavated in the area. 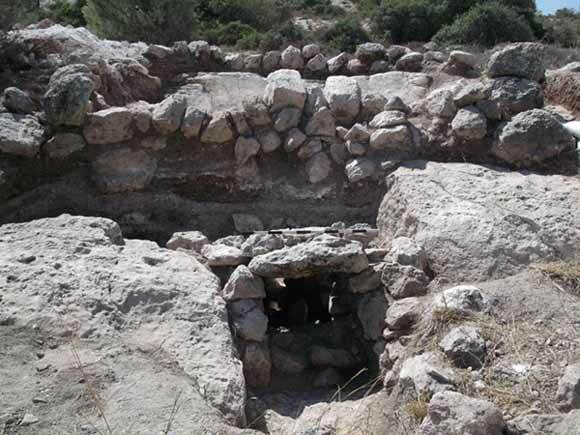 It can be assumed that the kilns were most probably operated by the inhabitants of the nearby Beit Nattif village. The location of the kilns, at an ample distance from the village, was chosen to avoid the disturbance to the villagers caused by smoke generated during the kiln’s operation. Another reason for the concentration of limekilns in the area may be correlated to suitable bedrock that could supply plentiful accessible raw material (soft limestone). These limekilns together seem to be part of a large system of lime production that operated during the Ottoman period in conjunction with a rise in demand for lime. 3. The limekiln's firing chamber and natural depression of bedrock, looking southeast. 4. The kiln’s support wall (W1), looking southwest. 5. The built conduit, looking south. 6. Three ventilation windows set in W2, looking north.